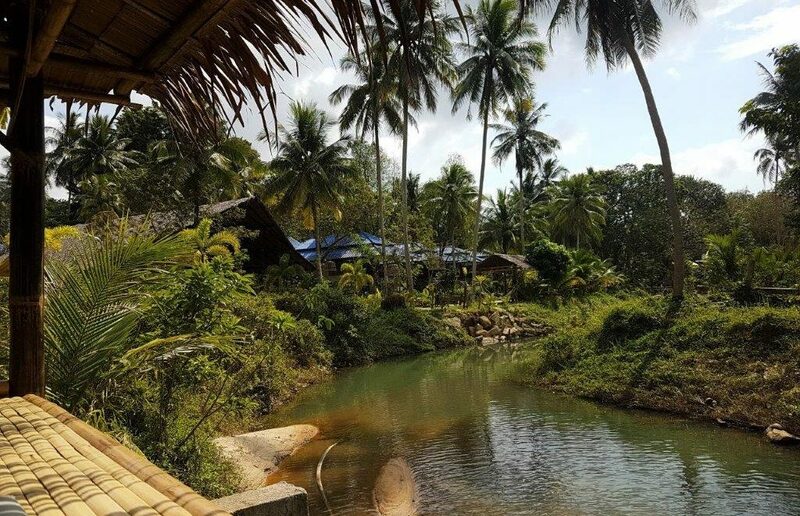 So you’ve been to the Full Moon Party and are thinking now what to do in Koh Phangan after all the partying and booze. I can tell you a “secret”. 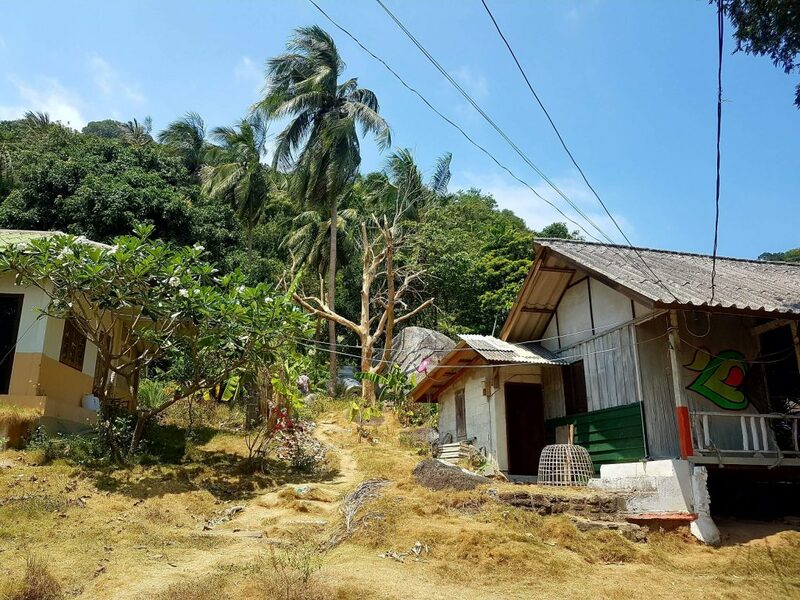 Koh Phangan is not just about the parties. Or yoga. There are a lot of different activities you can do here. More in the water perhaps but also on land. 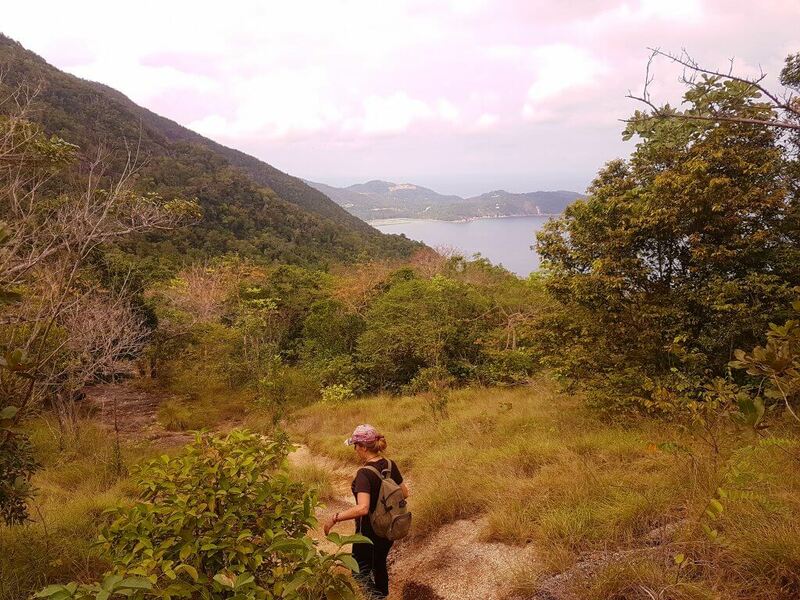 So get healthy and fit for change and try these cool hikes in Koh Phangan. Guaranteed to give you sweat and amazing vistas. Bottle Beach is also called Haad Kuad which is the Thai name. The hike leaves from around Haad Khom which is near Chaloklum. The path is marked pretty good, unlike some other trails. So you don’t have to worry about getting lost. I did this trail with a friend of mine who is an experienced hiker. It took us only about 45-50 minutes but we kept the pace up. When you get to Bottle Beach, relax, sit down and order yourself a coconut water or something to eat. The best way would be to spend the day at the beach because Bottle Beach is quite beautiful. We were in a bit of rush so just had a short breakfast/lunch break and went back the same way. You could also take the boat back but then it gets a bit trickier if you have left your motorbike at the starting point. Khao Ra is the highest mountain on the island, some 630 meters high. It makes a nice trek because the trail is trodden and you don’t have to worry about getting off the track. There are a few spots that are a bit tricky but otherwise, it is not too demanding. Yes, you will get sweaty for sure and need to have short breaks but apart from that, it’s fine. If you go slowly, it takes maybe 1hr 45min. Nowadays they collect a small entrance fee, 20 baht which includes a bottle of water. 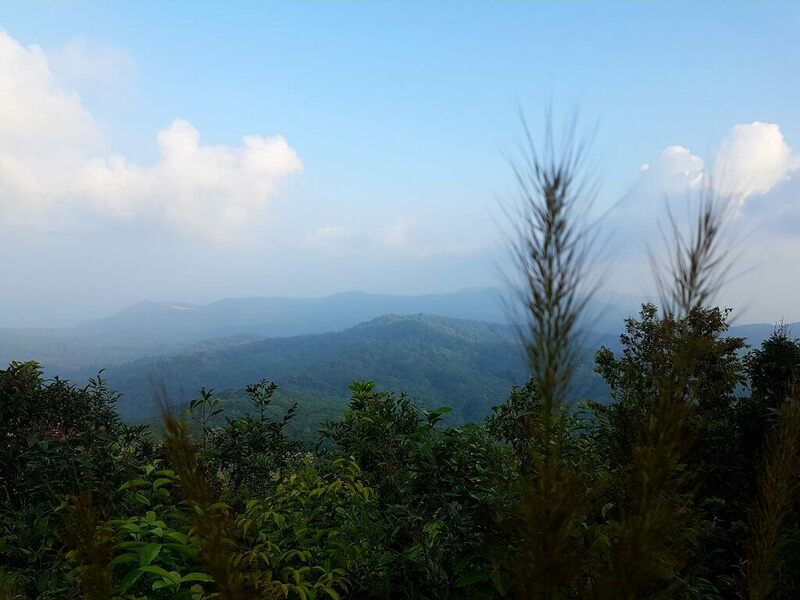 Once you get to the top, amazing vistas are waiting for you. It’s really cool looking at Chaloklum from a completely different perspective. 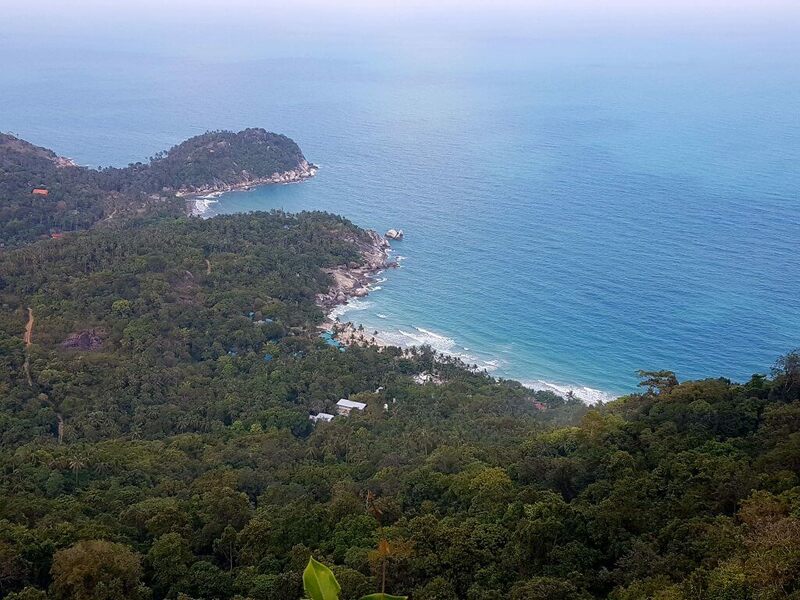 If you move a few metres to the right, you get to see the East Coast and the sadly famous Koh Phangan airport spot. The airport constructions seem to be on hold for the time being. But this is Thailand. You never know. Or to put it another way, everything is possible. I used to live quite close here so was a frequent visitor to the national park. Recently, they started charging 20 baht for the parking fee. They have a few restaurants at the headquarters if you need to buy water or perhaps enjoy a fresh coconut after the walk. By the way, if you didn’t know already, fresh coconut is very healthy as it has different electrolytes and this becomes especially important in hot climates where you sweat a lot. Anyway, as the name says, you can expect to find a few waterfalls here. During the rainy season anyway. When it rains a lot, the waterfalls are beautiful but when we get towards the hot season there is not much to see. You can also swim in the pond at the bottom, in the chilly water that comes from the mountains. Many walk only to the Dom Sila viewpoint which takes about 15 minutes. A lot of people wear just flipflops but I would advise using proper shoes. 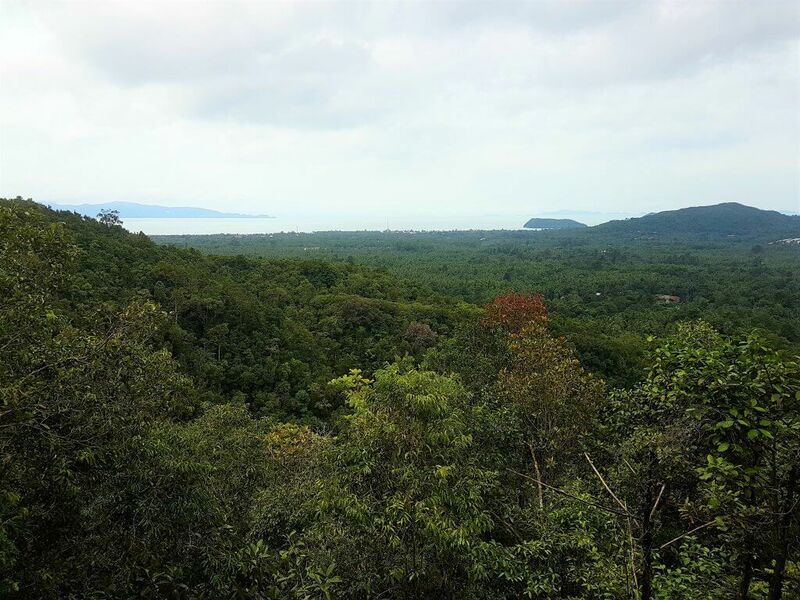 From Dom Sila, you get a beautiful view overlooking Baan Tai, Thong Sala, and the West Coast. If you want to keep on going there’s a clearly marked path taking you to the upper level where you can see one of the waterfalls and its stream running down. 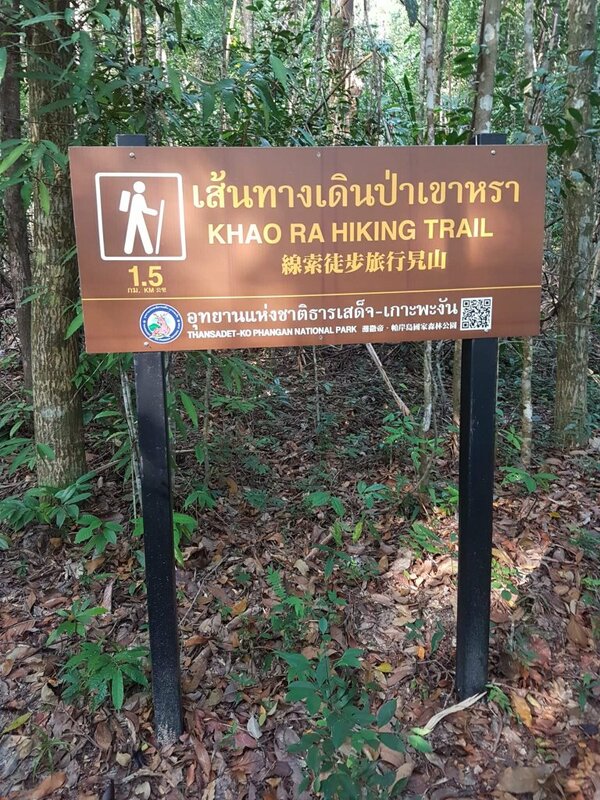 If you are fairly fit and need some challenge, you can continue all the way to Khao Ra from here. But I must warn you. The trail is not super clearly marked at times. Don’t do like I did: a) go on my own b) not so much water with me c) no snacks d) with a low battery in my cell. I know. It was a stupid thing to do. However, it was a cool hike and I saw eg. monkeys and a massive eagle. 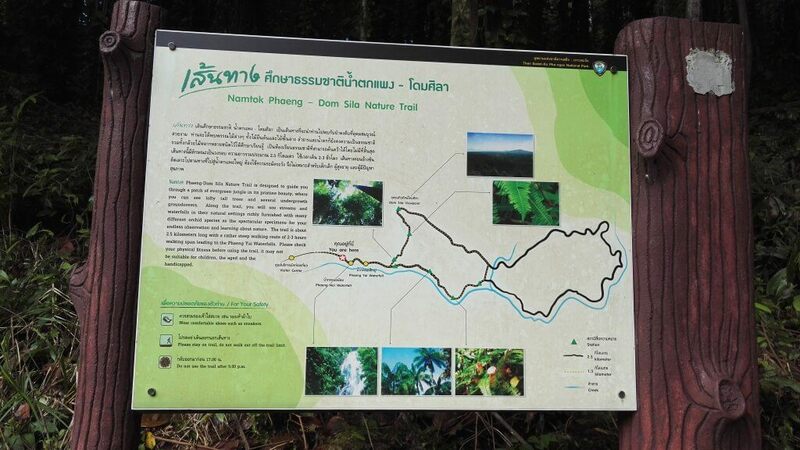 You can also hire a guide at the Phaeng waterfall headquarters. I can’t remember exactly how long it took me but I’d say 3,5 hours because from Khao Ra you then need to walk back to Phaeng as well to get your motorbike. This is a very popular hike and the trail is clearly marked. 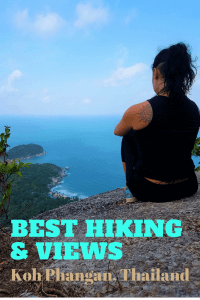 If you haven’t been to the Tri-Bay area perhaps you could make this hike and spend the whole day getting to know Haad Yuan, Haad Thien, and Haad Whynam. This area is a bit more expensive but many people who stay here keep on returning to the magical bay area year after year. The well-known yoga/wellness retreat The Sanctuary is also situated here and a few other yoga schools. 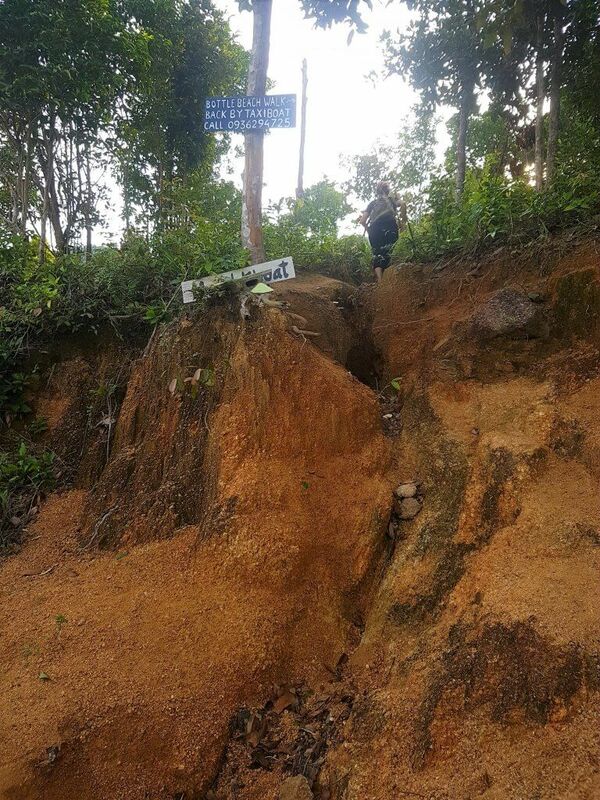 Many people also make the hike so they can avoid paying 300 baht/ oneway to the taxi boat drivers. 300 baht for the short 15-minute ride is a ripoff really but what can you do? Anyway, the starting point in Haad Rin is next to Palita Lodge, on the left of Palita’s gates and it’s hard to miss. You dodge the barbwires and after that walk up next to a small cluster of houses. This is the way, up you go! It feels a bit strange walking almost in someone’s backyard but this is the way. You can see a dead tree and silver barrel in the yard and this is where the trail starts. The start is a steep climb so prepare to get sweaty! 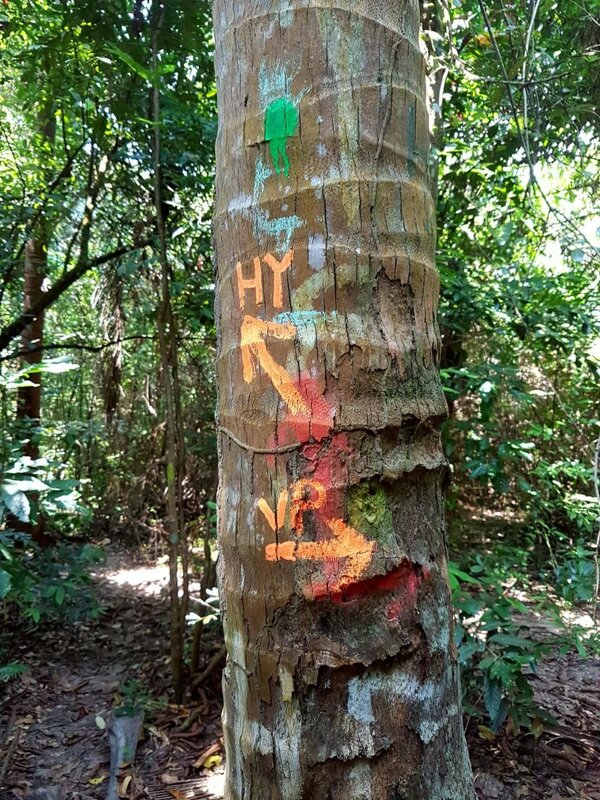 Around halfway you will notice a palm tree trunk which says HY and VP. If you go left, you will continue to Haad Yuan. If you turn right, you will reach a spectacular viewpoint in about 5 minutes. I would definitely take the detour. It took me a bit over an hour to do this approximately 3km hike, though I walk quite fast. If you want to take your time looking around or need to catch your breath, it might take nearly twice as much or even more. 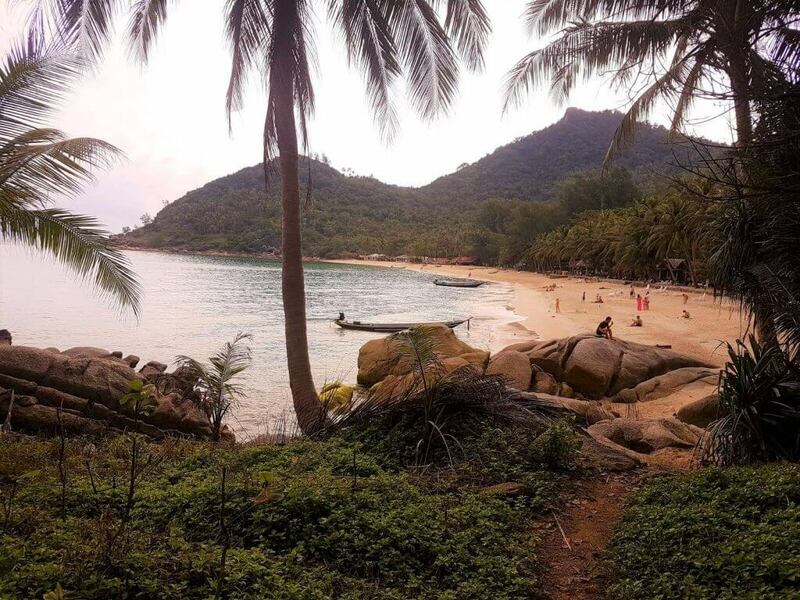 Still wondering what to do in Koh Phangan? 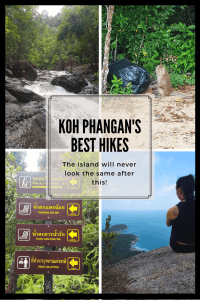 I wish that this post gave you a few ideas on what to do in Koh Phangan and people would realize that Koh Phangan is not just about Full Moon Party and other parties. A lot of activities to do here, hiking being among them. That being said, which one would you like to do next, by the way? 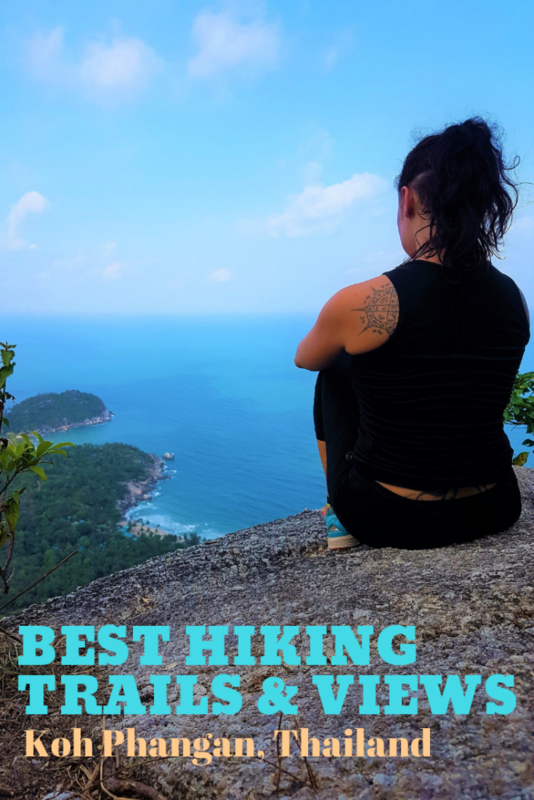 Any hikes or places you didn’t know of? Or vice versa, if you know a hike that wasn’t listed, would you care to share it with us?! After hiking, a visit to a local sauna might be worthwhile: after all, we have a few pretty awesome saunas/steam rooms here. 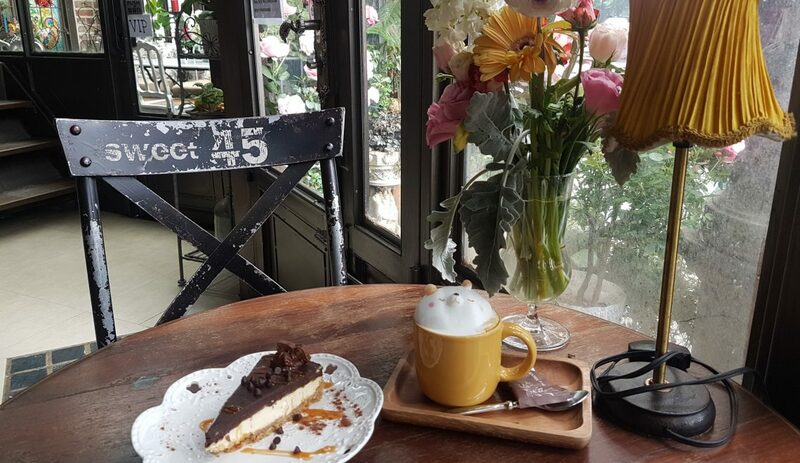 Alternatively, if you are getting hungry just by thinking of doing these hikes, have a look at this Ultimate Koh Phangan Cafe Guide. Ok, I have to admit that I get a little bit stuck on this island as well. 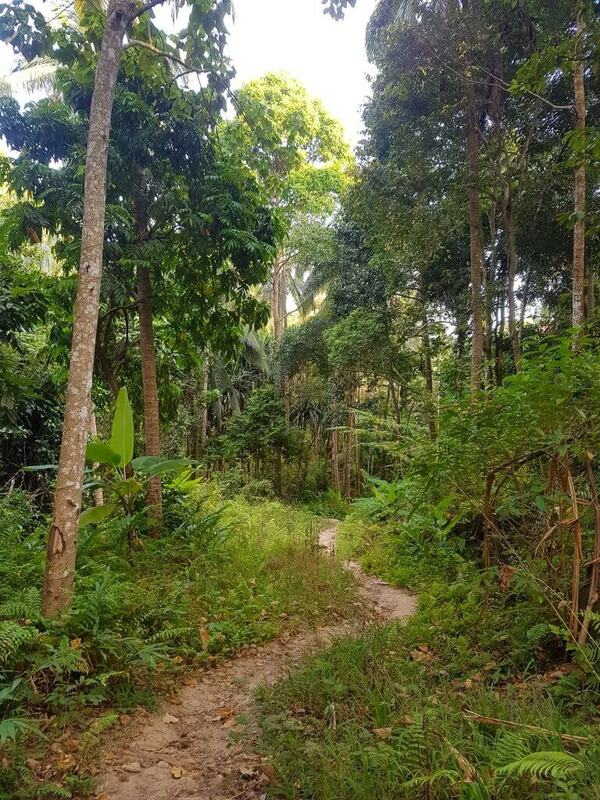 If you are running out of things to do and want to get away from the crowds, check out this Southern Thailand island hopping post by Per. Furthermore, and most importantly, enjoy the hikes and beautiful scenery! It so nice to see a side of Koh Phangan beyond the beach and parties. Love these hike suggestions. I love your photos! 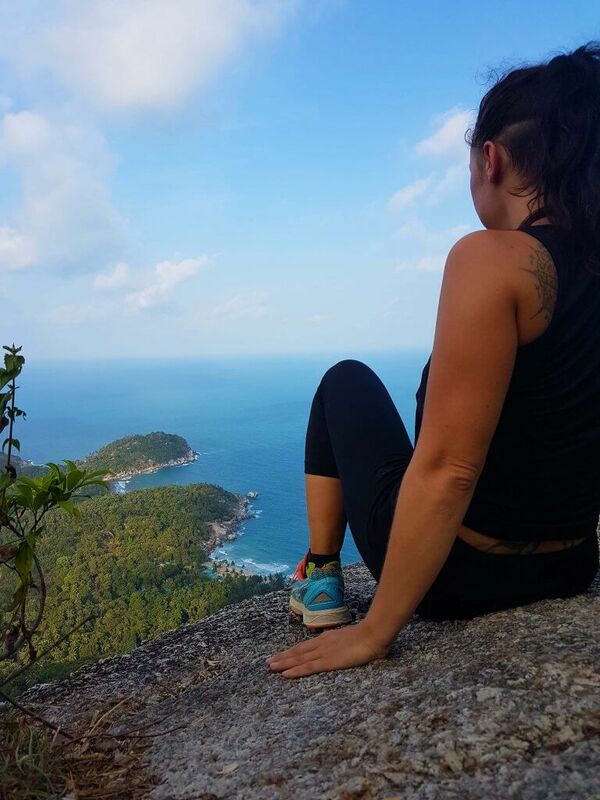 Last time I didn’t know Koh Phangan has such good hikes and views! Definitely need to go back and move away from just the beaches! 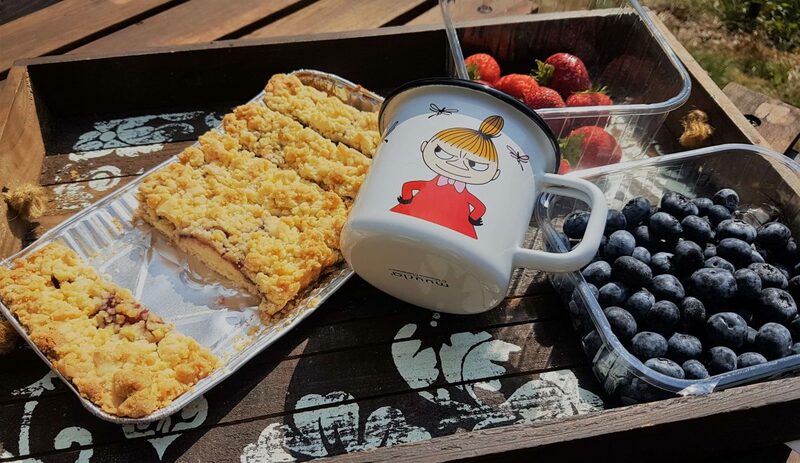 Thanks, Greta! But hey, at least you know that it’s not just about the parties =) Many think this island is only for the FMP – unfortunately. 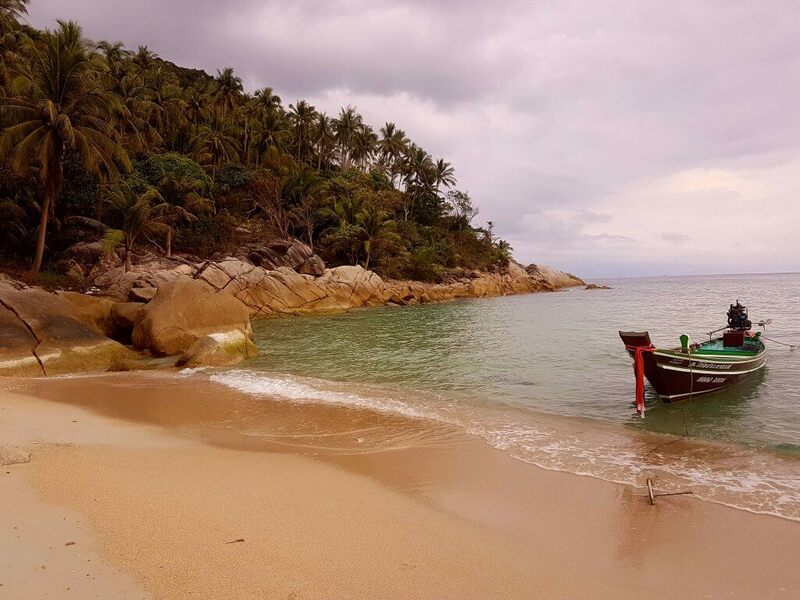 I’ve been to Koh Phangan, the long beach is beautiful. 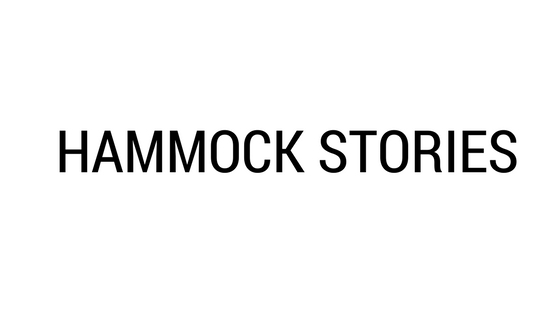 I like to sleep with a hammock here. Such an informative post! 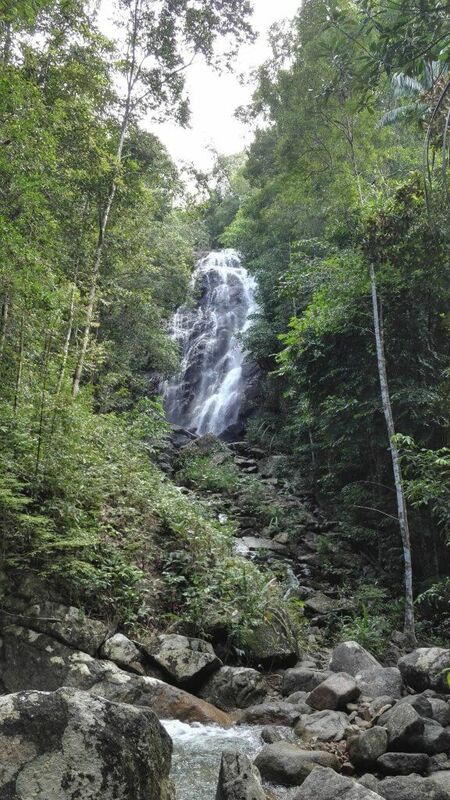 Beautiful waterfall, jungles, beaches, and awesome view from the top. Thanks for your sharing. I have to say that your pictures are just wow. I am really into trekking, so I will follow your list to discover all of these places. Thanks a lot!! Thank you so much. Glad you liked it!